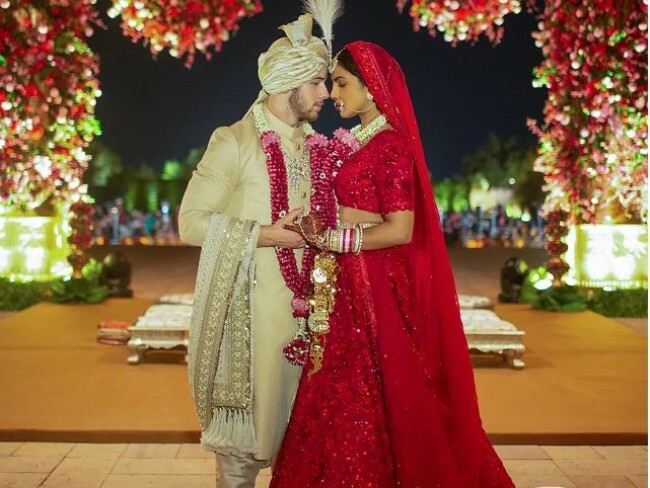 Jodhpur, Dec 4 (IANS) Actress Priyanka Chopra, who said “I do” wearing a 75 ft long veil for her Christian wedding ceremony with American singer Nick Jonas here, says she was nervous and scared before the nuptial. But her worries flew away when she saw her groom waiting for her down the aisle. “Every girl dreams of being a princess on her wedding day. But I never had a plan about what I wanted it to be,” people.com quoted Priyanka as saying. “It melted my heart,” said the “Quantico” actress, adding that being able to have two big weddings, in India, with their closest family and friends was “unbelievably special”. There were 225 guests in all at the epic weekend wedding at the majestic Umaid Bhawan Palace here. These included Nick’s brothers Kevin with wife Danielle, Joe with fiancee and actress Sophie Turner and Frankie along with Priyanka’s brother Siddharth. The festivities — which also included a friendly cricket match — were all planned by Sandeep Khosla and Aditya Motwane, respective founder-owners of Abu Jani Sandeep Khosla and Motwane Entertainment & Weddings. On December 1, the day after the couple held a ‘mehendi’ ceremony and a sangeet that night in which both families performed elaborate musical numbers, Priyanka and Nick were married in a Western ceremony on the palace’s lawn. Wearing a hand-beaded and embroidered Ralph Lauren gown with a 75-foot long veil, Priyanka looked ethereal as she was escorted down the aisle by her mother Madhu. “It was all tears. All tears,” said the actress, who carried a bouquet of hyacinths and tuberoses designed by Jenya Flowers (NYC), which created the floral arrangements for the entire wedding party. “I could not hold it in. I think I was nervous and scared. But as soon as the curtains opened, and I saw his face it was just like everything settled and I knew I was making the best decision of my life,” she told People magazine, which had exclusive access to the stars and their wedding photos and videos. An inside look #Nickyanka’s gorgeous #WhiteWedding . As for Nick, “the emotions were running high during the ceremonies”, especially during the Western wedding. “You know you think your whole life about that moment. Honestly, I could not have imagined it would be as perfect as it was. It was highly emotional,” said the star of the former The Jonas Brothers band. For the Hindu wedding ceremony on Sunday, Priyanka sported a deep red lehenga, choli and dupatta. She looks every bit the ‘desi’ bride with the chooda, kaleere and garland. Nick is dressed in a sherwani and a turban. They concluded the weekend with a Bidaai, a bridal ritual. “I love that our wedding was a religious mash-up,” said the actress.